Most of the people who attended the Four Star Grand Cru Wine Dinner at the "Inside the Kitchen" event last weekend were prepared to be impressed. After all, the headliners -- Ron Siegel, David Kinch, Hubert Keller and Roland Passot -- are all four-star chefs, and their restaurants are the creme de la creme in the Bay Area and beyond. Against this backdrop, however, something unexpected happened: a young pastry chef, perhaps accustomed to toiling away out of the spotlight as he builds his career, stunned the crowd with his innovative, delicious, and utterly satisfying desserts. This seemed to be the culinary equivalent of the walk-on actor who almost steals the show, a forceful exclamation point demanding that we sit up and take notice. So, who was this mysterious talent? His name is William Werner, and he's the Pastry Chef for both the Ritz-Carlton Half Moon Bay and its flagship restaurant Navio. 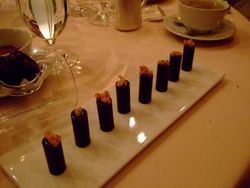 Now, I have never studied the confectionary arts, nor am I an expert in the field as are some of my favorite bloggers. What I can tell you, however, is that I can't remember the last time I was so excited by the flavor combinations that a pastry chef incorporated into his or her desserts, and so impressed by the creativity that he or she displayed in doing so. Indeed, nothing that Werner served that night was ordinary, and everything tasted fantastic. 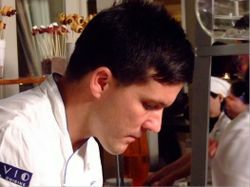 If Werner keeps this up, I guarantee you that he will end up leaving a lasting mark on the art of making desserts. The first dessert for the Four Star Dinner was French Butter Pear Nage with Pain D'Epice Ice Cream and Creme Fraiche. With the richness of butter, the distinctive taste of pear, and a smooth ice cream having the perfect amount of gingerbread flavor, how could this not be spectacular? I also liked the fact that Werner was mindful of texture, combining ice cream, foam, nage and a crispy sugar wafer to wonderful effect. 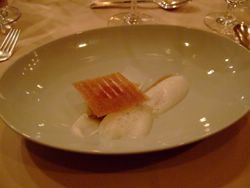 The presentation for this dessert was beautifully done, the thin wafer perched on top of the ice cream and a frothy foam and creamy sauce lying on the surface of the plate below. 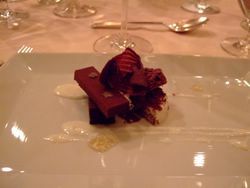 The second dessert was equally satisfying, a Smoked Chocolate Plaque with Vanilla, Coconut and Aged Rum Pearls. 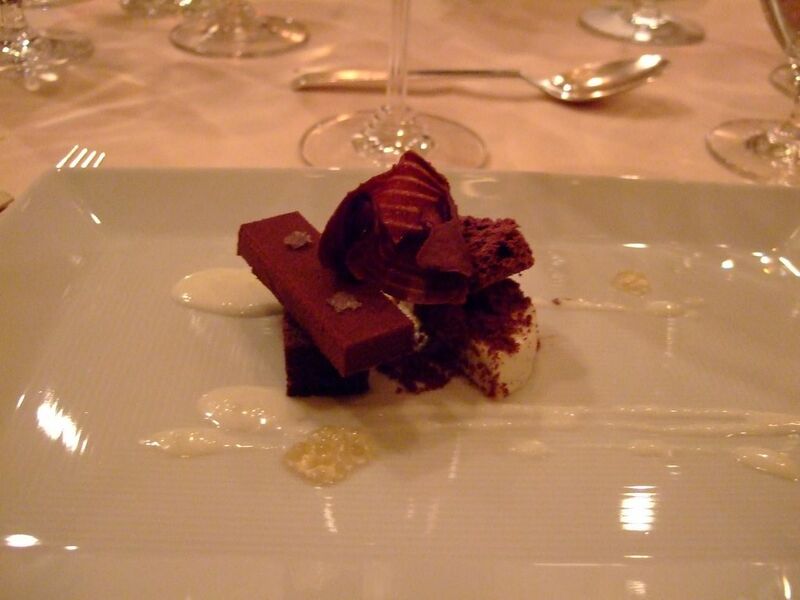 A small brick of dense chocolate sat offset atop a rectangle of moist cake, a quenelle of vanilla bean-specked cream and a smoky chocolate wafer off to one side. At two locations on the plate, Werner placed a tiny mound of translucent tapioca pearls -- a clever visual reference back to the caviar in the Ron Siegel dish that kicked off the meal a few hours earlier. Here again, the flavors were wonderful. The deep chocolate was punctuated by unexpected bursts of salt, while its decadent richness was cut by the bright and airy cream on the side. The tapioca pearls provided another surprise, delivering a potent punch of rum -- and yet another texture -- to the overall mix. 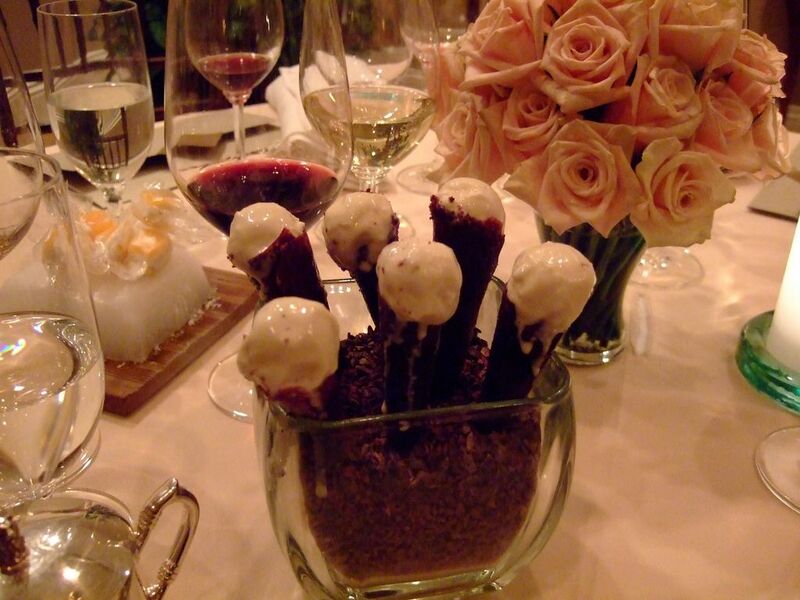 Simply put, both of Werner's dessert dishes were spectacular. At this point in the meal, the kitchen usually sends out a parade of mignardise -- tiny tartlets, financiers, macarons, and marshmallows. Yet, even here, Werner's innovative streak shined through. We were treated to crunchy chocolate cones with a small scoop of coffee ice cream, mango cream bonbons, chocolate caramel cookie rings spiked with hot chili pepper, and small chocolate cylinders with a eucalyptus-infused filling. As you can see, there was none of the tired fare that even the best restaurants trot out after the "real" desserts, and every last item had been the subject of great care and attention. 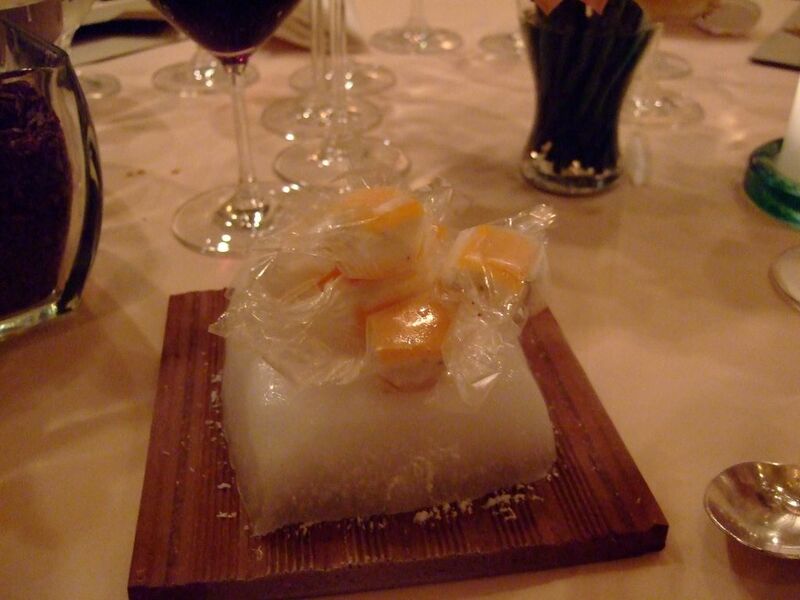 I mentioned in my last post that I hope to revisit Navio soon, given that Chef de Cuisine Aaron Zimmer contributed an outstanding cheese course to the Four Star Dinner menu and has also has been generating some buzz. But even putting those factors aside, the opportunity to experience William Werner's magnificent creations once more is reason enough for me make the trek down to Half Moon Bay. Note: For purposes of full disclosure, I attended certain events during the "Inside the Kitchen" weekend on a media pass that gave me free access. With regard to the dinner referenced above, however, I paid full price for my ticket using my own funds. Please see the end of this post for additional details. Oh, this is so exciting! I spent most of the summer looking for extraordinary pastry chefs in SF and concluded that Campton Place is a must for the outstanding, provoking creations of Boris Portnoy, formerly of Winterland. Now I can add The Ritz-C in HMB to my list for next year's assignment. Thank you! Thank you for writing about my field in such a wonderful way. It's rare pastry chefs are given so many paragraphs of their own! Catherine: It's funny that you should mention Boris Portnoy. 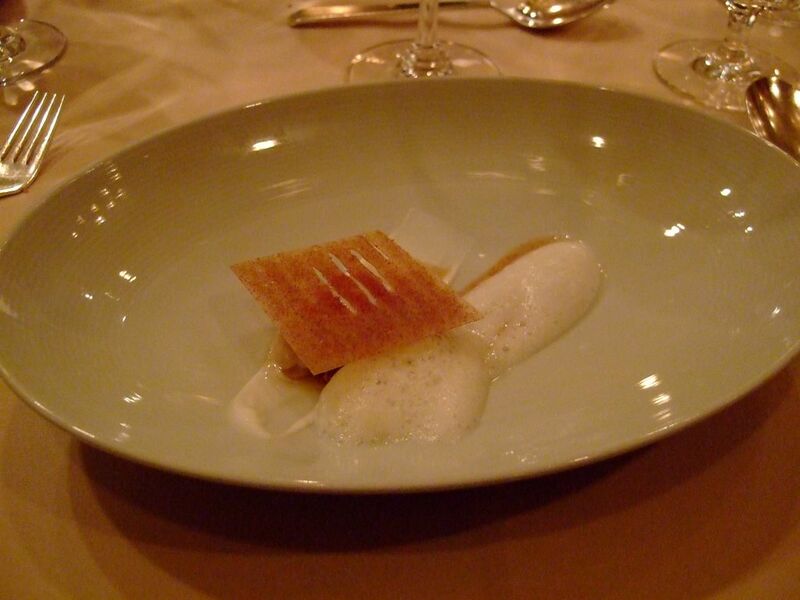 As I was writing this post and thinking back to other spectacular desserts I've had over the years, Portnoy's Caramelized Brioche from Winterland immediately came to mind. 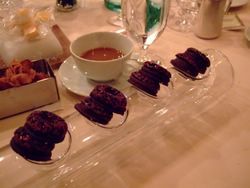 One of these days, I'm going to get back over to Campton Place -- perhaps for the special "Food Musings Dessert Tasting Menu!" Shuna: Pastry chefs truly are the unsung heroes of the food world, so I'm more than happy to do my part to acknowledge all of you who are doing outstanding work in the field! I'll also second your comments about Keith Jeanminette, as I have consistently been impressed with his desserts at Masa's. And thank you for adding a link to this site in your sidebar!